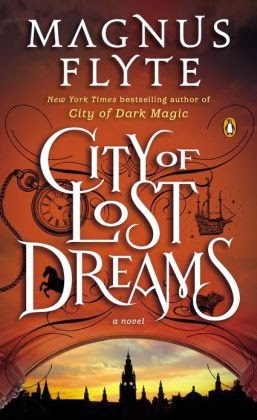 This stands-on-its-own sequel to City of Dark Magic is so good readers will want to read more from Flyte. Sarah Weston, armed with a PhD in neuromusicology has traveled from Boston to Prague where her young friend, Pols, a blind twelve-year-old prodigy is dying due to a genetic defect. Before leaving for Vienna to try to convince a nanobiologist to try to help Pols, Sarah dines with her friend Nico, a 400 year old dwarf, and Max, her princely ex. Sarah sees a man flailing about in the cold water and jumps in to save him. Her efforts lead to gunshots and the man she cannot save turns out to be John of Nepomuk, a martyred saint from the 14th century. Rich with history, alchemy, romance, drug infused time travel, and mystery, this tale is wonderfully amusing and satisfying. It goes onto my list of best of 2013.